Brexit and British Airways, easyJet, Ryanair, et al. European Union would not immediately ground intra-EU flights operated by British airlines after 29 March 2019 in case the UK nosedives out of the bloc with no deal, as it could set a new deadline for air carriers to reach a majority of EU ownership to maintain their operating licences. IAG was warned by Brussels that its favoured strategy to allow it to continue to fly freely in and around Europe in the event of a no-deal Brexit will not work, as European carriers will have to show they are more than 50% EU-owned and controlled to retain flying rights in the bloc after Brexit. Spain must notify the European Commission by the beginning of February 2019 if Iberia is a Spanish company, else it will not be able to perform flights within the EU in case of a no-deal Brexit. Strange, no? Airbus warned that it could move wing-building plant out of the UK in the future if there is a no-deal Brexit. EasyJet Chairman John Barton said while the airline was confident a reciprocal UK-EU “right to fly” arrangement would emerge should the UK leave the union without a deal, it was prudent the airline continued to establish itself in Europe. Hence the continued transfer of aircraft from the UK unit to the Austrian unit. On 19th February 2019, the European Parliament and the Council of the EU reached a provisional agreement on the European Commission's proposal to ensure basic air connectivity in the event of a “no-deal” Brexit. This is part of the Commission's Brexit contingency proposals to limit the most significant damage caused in case the United Kingdom leaves the European Union on 29 March 2019 without a Withdrawal Agreement. Commissioner for Transport Violeta Bulc welcomed the agreement: "Basic air connectivity between EU and UK airports will be ensured, provided that the UK gives the same treatment to EU airlines. This means that EU passengers will still be able to travel by plane in case of a ‘no-deal' Brexit. 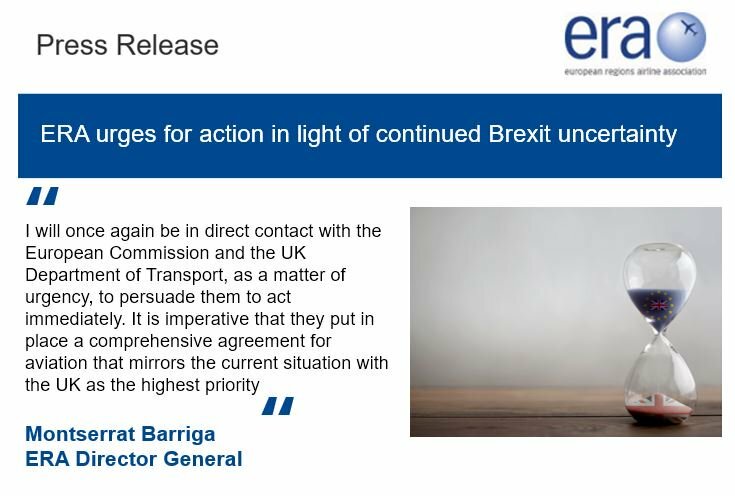 However this in no way replicates the significant advantages of the EU's single market.” Yesterday's provisional political agreement endorses the contingency measures proposed last December by the Commission to ensure basic connectivity. Cargo routes with third countries will be allowed for a limited period of five months, so that the airlines concerned can wind down operations and re-route traffic as necessary. EU airlines partly owned by UK nationals will also be given six months to do the necessary to achieve EU majority ownership and control. These contingency measures will not – and cannot – mitigate the overall impact of a "no-deal" scenario, nor do they in any way compensate for the lack of preparedness or replicate the full benefits of EU membership or the favourable terms of any transition period, as provided for in the Withdrawal Agreement. They are temporary in nature, limited in scope and will be adopted unilaterally by the EU. They are not mini-deals and have not been negotiated with the UK. Therefore, the continuation of all existing air transport services under the same terms as they are supplied today cannot be guaranteed. Next steps: the text of the Regulation will still have to be formally approved by the European Parliament and the Council. As part of the same package, the Commission has also proposed a Regulation that implements contingency measures in the area of aviation safety. It ensures in particular that EU airlines and other aircraft operators can continue to operate aircraft that contain parts made or serviced in the UK. Air France KLM has the right to sell the 31% stake it has acquired in Virgin Atlantic back to Virgin Group if a hard Brexit prevents the UK carrier’s ability to operate. Aer Lingus, Iberia and Vueling were given a six-month deadline by the EU, in the event of a no-deal Brexit, in which to restructure their shareholding and thus ensure they are eligible to continue operating as European companies. Boeing has been shifting spare parts between its distribution centres in the UK and elsewhere in the world in preparation for Brexit. EasyJet announces its EU — excluding UK — ownership has increased to 49.9%, which is still below the 50% plus 1 share that will ultimately be required following Brexit. The European Parliament and the Council have reached a provisional agreement on the Commission's proposal to grant UK nationals visa-free travel to the EU after the United Kingdom's withdrawal from the European Union. This means that UK nationals will not need a visa when travelling to the Schengen area for short stays of up to 90 days in any 180-day period. The visa-free travel for UK nationals is conditional upon the UK also granting reciprocal and non-discriminatory visa-free travel for all EU citizens, in line with the principle of visa reciprocity. The agreement, confirmed yesterday by EU ambassadors and backed by the European Parliament's Committee on Civil Liberties, Justice and Home Affairs today, now needs to be formally adopted by the European Parliament and the Council. In the scenario where the UK leaves the EU without a deal, this would apply as of midnight on 12 April 2019. In a “deal scenario”, this would apply as of the end of the transition period, as outlined in the Withdrawal Agreement. The proposal made by the Commission, and agreed today, is one of the preparedness measures needed as a consequence of the United Kingdom's withdrawal from the European Union.